The day of filing my nomination। I got up early as usual। Read the morning papers over tea. BJP’s Sanjay Jaiswal nomination the day before was there. State BJP leaders Sushil Kumar Modi, Nand Kishore Yadav and Ashwini Chaubey were here to buck up their young candidate. The newspapers carried stories of their public meeting. I had been berated at the delay in the construction of my sugar mill here. They conveniently forgot that final clearances were given only on the 17th of March and engineers and contractors have got down to work without any delay. That’s ok. It’s election time and even my efforts to bring prosperity to Champaran will not find appreciation with my opponents. That too is ok. My sincerity is for people to judge. After a small bowl of fresh curd for breakfast, I set out for the Collectorate to file my nominations. The model code allowed me an entourage of five. We were one less. I got in early, before 10 O’clock : before my enthused people could join me in a procession and violate the model code in their zest। I waited for an hour for the Collector Dilip Kumar- the Returning officer- to arrive. After a while, the CPM candidate, Ramashray Prasad Singh walked in with his comrades- including Ali Ahmad of the CPI and Mohammad Saidulah, an Advocate. Comrade Singh and I shared a warm hug. Do really wish all opponents fight this electoral battle with equal spirit and sportsmanship. That would really be good : A Hip Hip Hurray to Democracy. Filing papers went off smoothly। As I came down the stairs, RJD’s Raghunath Jha the candidate from our coalition for the Vamikinagar seat was walking up। We met half way, shook hands and wished each other. The waiting media had questions for me. But none on serious election issues. All they wanted to know whether film stars-particularly Katrina Kaif, Ajay Devgan, Manoj Bajpai , Arjun Rampal and Nana Patekar, all part of my team in my under production film ‘RAJNEETI’- would be coming to campaign. Now, election is serious business, not entertainment. No doubt Katrina and others would add colour and glamour to the campaign canvas. But do I really need them here, much that they are eager to come? 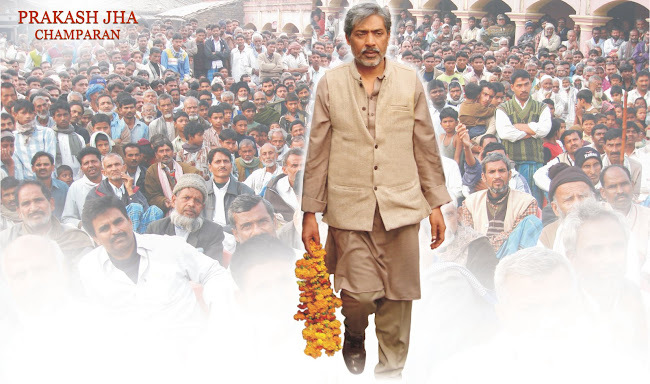 FOR ME, MY PEOPLE ARE MY STARS IN CHAMPARAN. And how spontaneously jubilant and encouraging were my heroes and heroines- more than a hundred thousand of them- at the public rally at Bara Ramna maidan soon after. Their response gave me much hope and confidence. 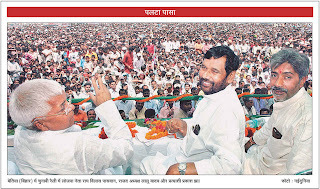 Leaders from our coalition- Shri Lalu Prasad Yadav and Shri Ram Vilas Paswan- were happy to see this mass of support. Lalujee had good words for my deeds and extended full support. Sadhu is here, as you now, on the Congress ticket. But Lalujee is with me. His message is clear : NO Kin. No Kinship. Just Development. And development is my sincere effort. I have set out to develop my Champaran. I need your vote. 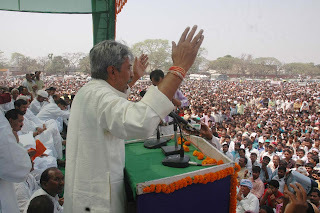 Each vote will add to attain our goal of a prosperous Champaran. And it is already forging for me a wide kinship transcending caste, creed and gender. Votes are becoming a cementing bond. The nomination process and the public meeting went off really well. And then, some one reminded me, it’s April ONE- All Fools Day. I really appreciate ur candidacy with LJP and hoping that u ll win the election.Do the needful for the contituency after winning as earlier it was neglected by all the party and leaders. Adopting popular language and idioms to reach out to common man is one thing and having a clear cut diagnosis of what ails Champaran is another thing. A simple look at development outcomes of this district in comparision to state avegare tells us a lot. As a professional economist belonging from this region, having worked on this region and working outside I can easily argue that what Champaran needs right now is very very clear. The point is whether you are ready to look at and face that starking reality or you chose a politically easier option of rhetoric. I have been closely following what Mr Jha ia arguing in his election campaign and I am really pained to watch that a Man like Mr Jha too fails to artulate development requirement of this region. otherwise you must had earned everything on your own,as you did ever in your lifetime. You would have contested independently,then it would have created a record margin of votes to win an election too.